The usual treatment is to take some antihistamines, or shut your windows and doors and stay inside. What if I told you that there was a solution right in your kitchen? Well, there is. The most important thing you want to do is build up resistance. A balanced diet will help you do this naturally, and will relieve those annoying symptoms. Eating a diet high in vitamin A and C can be the answer to your prayers. Vitamin A increases immune resistance. When the offending allergens strike, your symptoms will flare up if your immune resistance is low. It only makes sense that if we build up these resistors, we will have fewer to no symptoms. 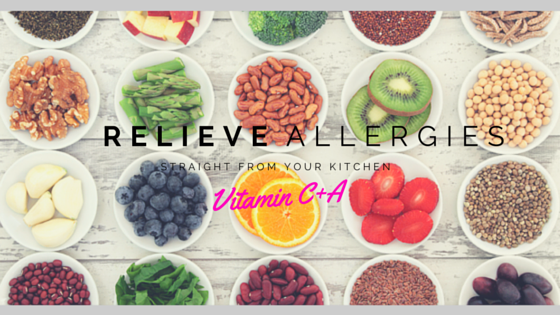 Vitamin C has antihistamine properties that will help inflammation. Inflammation of the eyes, nose and even throat can make for a very long and miserable summer. Munch on foods high in vitamin C for some relief. I recommend adding the following foods to your daily meals. I start my days off with a green juice or smoothie for a natural immune boost from Mother Nature’s medicine cabinet. Pineapple contains high levels of vitamin C and an enzyme called Bromelain. Both of these help to block inflammation. Fresh pineapple is a perfect spring and summer snack and it also goes great in juices and smoothies. One of my favourites is sliced pineapple grilled on the BBQ.